Termites are often called “white ants” because they are mostly pale brown to white. However, termites are very different to ants. As the two photos shown above, ant has elbowed antennae while termite has beadlike antennae. Ant has constriction between thorax and abdomen. It is easy to see that ant has three body parts while Termite has only two body parts as there is no constriction between thorax and abdomen. As shown on the photos below, depending on the species, termites can nest in the tree, on the tree, on the ground or underground. Termites exist in a colony in several castes – The queen, the king, workers, soldiers and reproductive. Both the queen and the king are long-live. They can live up to 20 years. The main function of the queen is reproduction. The king fertilises the queen from time to time. In most termite species, the queen become enlarged and distended with eggs. During the early life of the colony, both the queen and the king tends the young until the workers are numerous enough to take over these nursery duties. Worker termites constitue the greatest number (normally 70% or more) of individuals in a colony. They do most of the jobs including gathering food, maintaining and repairing, tending the young and feeding all the other castes. Soldier termites are usually darker in colour and have larger and darker heads than the workers. The main function of soldier termites is to defend the colony against invaders. Reproductives are the future kings and queens of colonies yet to established. In many species, if the queen dies or degenerates, some of their reproductives are selected to carry on the colony as neotenics. Winged reproductives are called alates and are ready to leave the colony and set up new colonies through colonising flight. 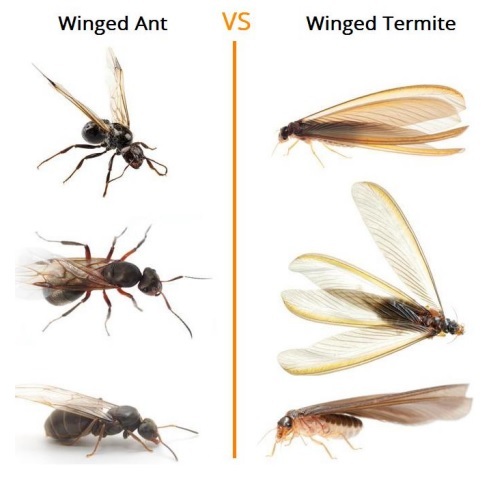 Some people are confused with winged ants and winged termite (termite alate). The photos below show the differences between the two.